There is no shortage of IT “solutions” to harness the broad array of education data. State and local education agencies, as well as teacher preparation programs, are not immune to the urge to implement the newest technological solutions. The result has been multiple systems for data storage, collection, and reporting with very little integration, standardization or alignment. Many organizations struggle even to get a comprehensive picture of the technology they already have. That is the necessary first step to knowing if there are opportunities to improve existing data structures, increase collaboration, and better meet your goals. Our diagnostic process provides a thorough review of current data systems, networks, processes and protocols in relation to your organizational goals to paint the entire picture of your technology landscape and identify gaps that should be filled. 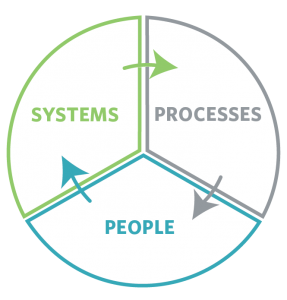 Technology systems can only be leveraged when the right people and processes are in place to support them.